Available for download, iZotope's RX Post Production Suite 3 combines Neutron 2 Advanced, RX 7 Advanced, Insight 2, and other tools to help facilitate the post production process. 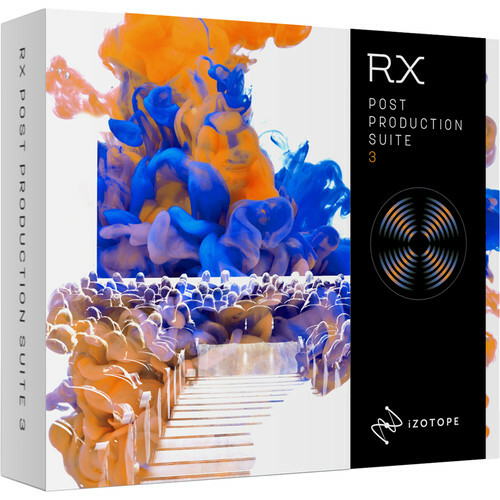 RX 7 Advanced gives you a spectral editor for zeroing in on troublesome audio, as well as a plethora of modules that can help you mitigate sonic issues anywhere in the frequency spectrum. It also provides a Repair Assistant which intelligently analyzes audio and suggests corrections. Neutron 2 provides a refined track assistant and a tailored limiter that meets broadcast specifications. Also provided are a noise gate, surround support up to 7.1.2, and RX Loudness Control, to help you meet your broadcast targets. Insight 2 is a comprehensive metering suite with customizable controls for loudness, frequency, stereo-field monitoring, and dialogue intelligibility. Integrated, short-term and momentary LUFS meters are provided as well as a loudness history graph that can be copied and pasted to text documents. You can also export a detailed history report that complements your resulting mix: a detailed loudness report and graph is made for clients in the broadcast world. For your convenience, the GUI is resizable, so you can make it as big as you'd like. This software operates in AAX, AU, VST, and RTAS formats. It is compatible with Mac and Windows platforms. Included are 250 sounds from Pro Sound Effects and a one-year, all access pass for Groove3 training videos.